Driving competitions and incentives might be viewed as a bit of fun and light relief from the day job, but they have a serious side too – ultimately producing better, safer drivers. One of the most prestigious is the Freight Transport Association’s (FTA) Van Excellence Driver of the Year competition, which was launched in 2014. And this year, as ever, the standard was particularly high. Eventual winner was Mathew Young from AAH Pharmaceuticals, one of two drivers taking part from the company, which has held its own annual driver competition for the last 16 years. He beat stiff competition to take the top prize after contestants took part in six challenges – driving style, economy, manoeuvring, defect checking, risk awareness and legislation (see panel below and results overleaf). The industry clearly sees the benefits of such competitions and businesses are keen to put their best drivers forward. Amey, which operates more than 8,500 vehicles, has taken part since it was launched – and telematics, which the company introduced to its fleet in 2009, plays a big role in identifying the winners. Amey fleet compliance manager Julie Davies says: “You’ve got to make drivers feel that you aren’t spying on them , but rather you want to help them become better drivers. But, maintaining that performance and encouraging drivers to engage with telematics poses the biggest challenge for fleet managers. A collaborative approach to driver improvement, therefore, is likely to have the greatest impact in achieving a lasting change in driver behaviour. Mark Cartwright, head of vans at the FTA, says: “What drivers like is being recognised for being good at what they do. Telematics allows them to see how they compare against colleagues and gives operators a way to address problems. Riverford Organic Farms runs its own competitions and delivery driver Gary Day has taken part in them in the past. He says: “I think it’s a great way to engage drivers and make them realise how their actions can directly affect the business. But they quickly adapted and a combination of coaching and internal driving competitions helped to turn opinions around. “The support we receive is really positive, the scores are put up each week and everyone tries to get to the top of the board. Overall I’d say that driving standards have got a lot better,” she adds. This exercise was all about saving money. It measured the driver’s actual fuel usage over a set route using both telematics and the vehicle’s on-board computer. To win, drivers needed to show a range of economy-boosting techniques, including gear selection, avoiding unnecessary braking and moderating throttle use. Perhaps one of the most important parts of running an effective van fleet, pre-use checking ensures the vehicle is safe and legal to drive. In this challenge a van was prepared with a number of common (and some less common) faults. Each contestant had 10 minutes to list every fault they could find. awareness element of a driving test, this computer-based activity required the drivers to watch video simulations and identify potential road risks. The legislation test was the most challenging for the majority of contestants on the day. The multiple choice quiz included questions about weight, speed, working hours and the highway code. Undoubtedly the most fun element of the day. Drivers had the chance to really prove their worth by negotiating obstacles and demonstrating awareness of both the vehicle and their surroundings. To ensure the test was as challenging as possible the other contestants weren’t allowed to watch and all the parking sensors on the vehicle were disabled. Young delivers time-critical medical supplies to a number of locations around Merthyr Tydfil and the Valleys from his base in Swansea. “The whole day was great fun – I enjoyed the challenges and the chance to prove my ability behind the wheel,” he says. Hanley was the only female in the competition and also has one of the most demanding driving roles day-to-day, delivering and collecting cash in and around central London. Having never taken part in any type or driving competition before, Hanley says she was attracted by the prospect of the £1,000 holiday voucher but also the kudos of being one of the country’s best van drivers. Despite having the least driving experience of all the contestants, Day performed extremely well in all the tests. He switched to a career as a van driver having spent 20 years as a car salesman. “Van driving is a lot better than I initially expected but I think it has a lot to do with the company you work for,” he says. 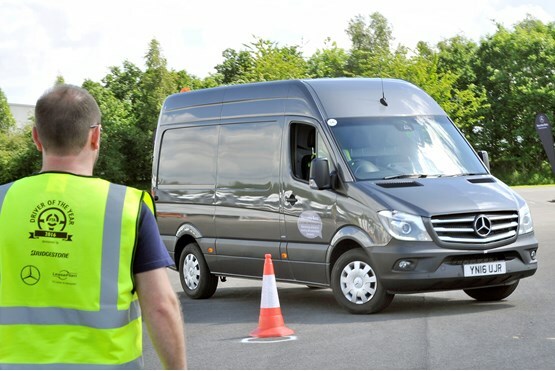 He found the manoeuvring to be the most enjoyable part of the day as the vehicle used for the tests (Mercedes Sprinter) was larger than the one he usually drives, posing a greater challenge.